We celebrated our anniversary at The Square in Mayfair, London. The Square is the restaurant of Phil Howard, and well established with an excellent reputation. Large tables in a spacious well appointed room awaited us. We started with rather good bread, brown for my wife and raisin and walnut for me. The amuse bouche was a mozzarella ball, chilli and pepper oil, biscuit, the mozarella was lovely, and complimented by the intense oil and a pastry of I believe olive and mushroom. 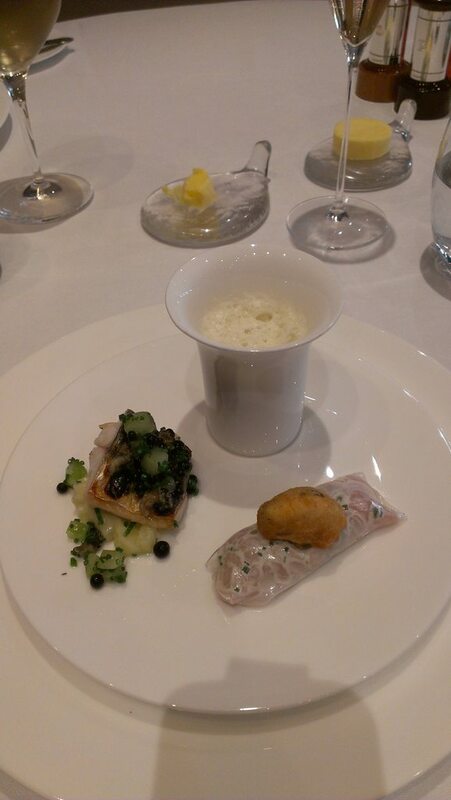 After much deliberation, the menu being packed with great sounding starters, I chose the Tasting of Cornish Mackerel with Oysters and Caviar, which was the Great British Menu Winner in their 2012 season. The first element came under an impressive dome of hickory smoke. 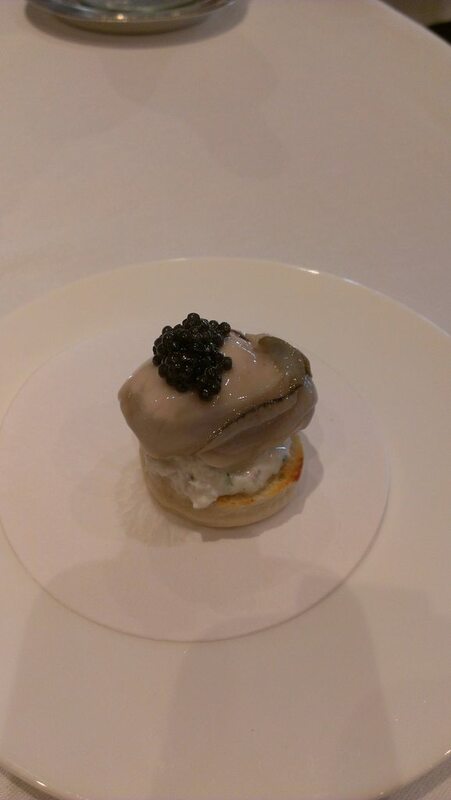 An oyster topped with caviar resting on an English muffin. The oyster was fine, salty with caviar and juice, which was balanced out by the sweet mackerel below, with a perfectly light muffin providing a delicious mouthful. The second plate was a rich, creamy veloutte of mackerel, a wonderfully fresh parcel of raw mackerel topped with a breaded fried oyster, and roasted mackerel on a bed of cucumber with a spherified caviar. 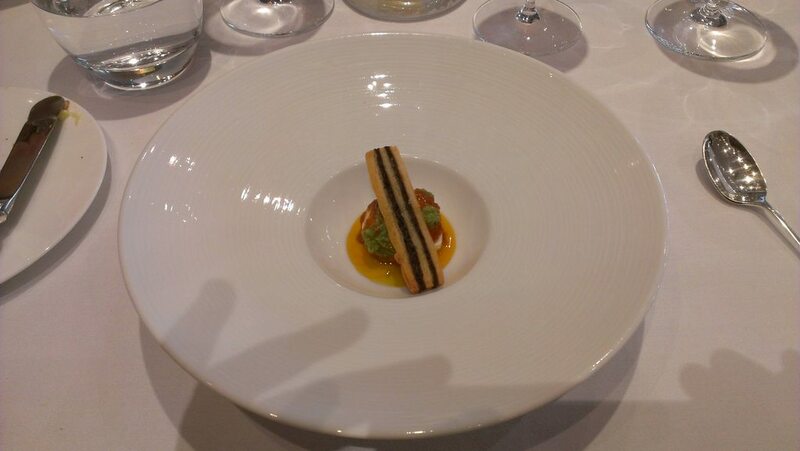 The last element was cooked to perfection, and balanced really nicely with the cucumber and caviar. It was great to try one of the dishes I've seen on the Great British Menu, each element an absolute pleasure and I'm glad I picked it over the lobster or scallops, dishes I will have to save for another visit! 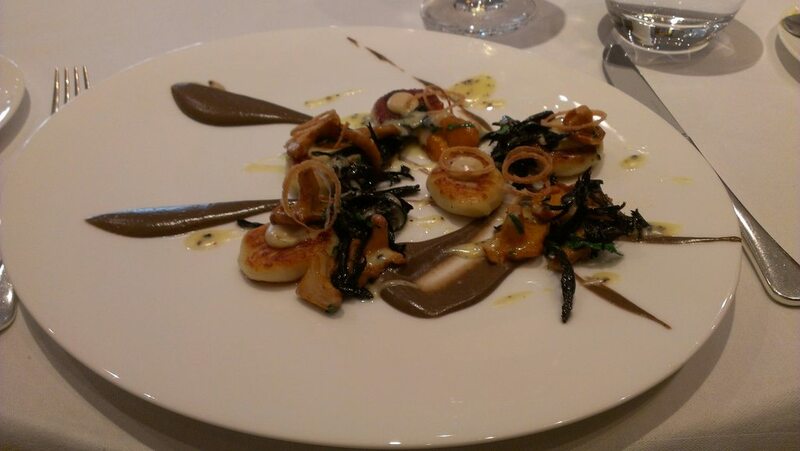 My wife had a starter of gnocchi, mushroom, onion, the gnocchi being more like fluffy potato cakes and went exceedingly well with the mushroom, seaweed and some crispy shallot rings. 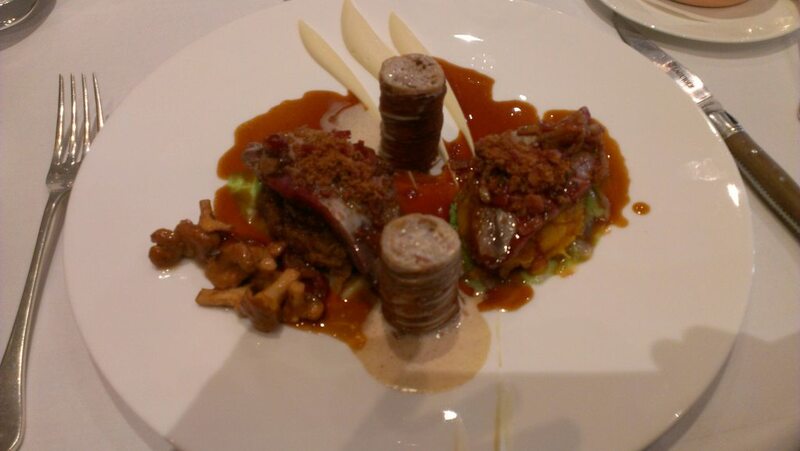 My main was the Breast of Grouse with Turnip and Celeriac and a Croustillant of the Leg with Onion and Pancetta. I've not had grouse before, and it was served was pink, and delicately flavoured, and a pleasure I will wish to repeat. The croustilliant was stuffed with the leg and was rich and intense. The celeriac and white onion puree's were creamy and well flavoured, and went perfectly with the grouse and leg. One breast was served on a buttery carrot and turnip mash, the other on a lovely piece of cabbage. My wife's main was Aubergine, piperade, coco beans. She enjoyed it, but it was quite a small portion, and eclipsed by the starter and dessert. 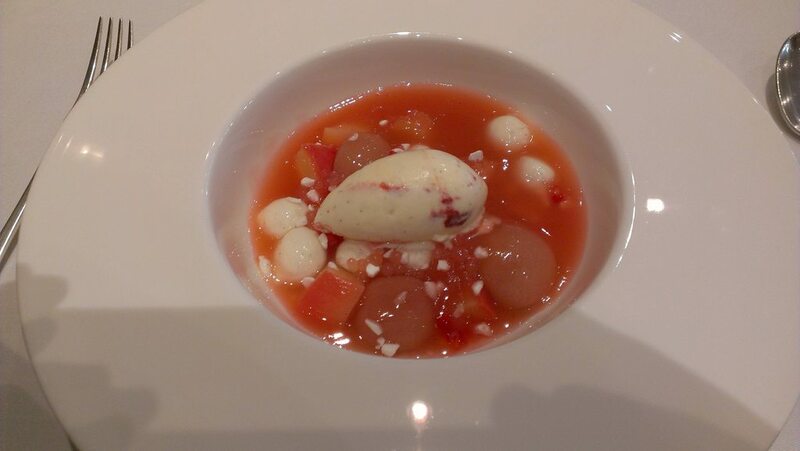 For my dessert I had the Soup of White Peach with Raspberry Ripple Ice Cream. A bowl of mysterious gel spheres, peach and ice cream were presented, and the soup poured on. 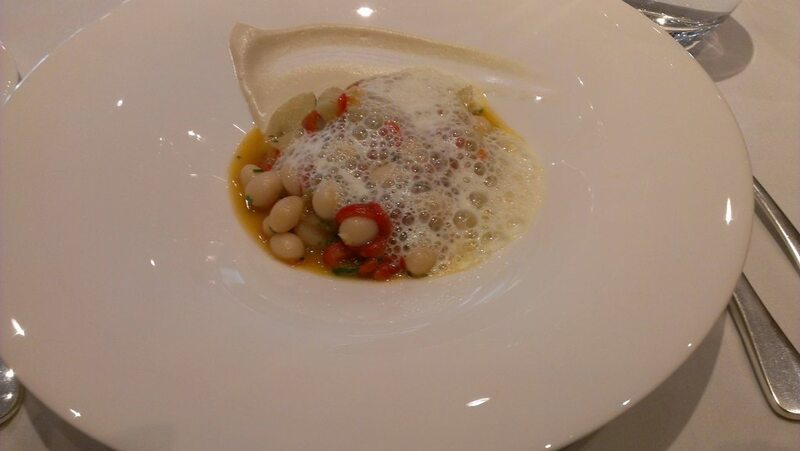 The spheres were a puree of peach and a liquid cream made using spherification which burst in the mouth. The peach was beautifully flavoured, as was the intense and alcoholic peach soup, the raspberry ripple providing a creamy counter note to the peach. I adored the spheres, the fun they added, and how they worked with the soup and peaches, and every part of the dessert was perfectly done. This has to be one of the best summer desserts anywhere. 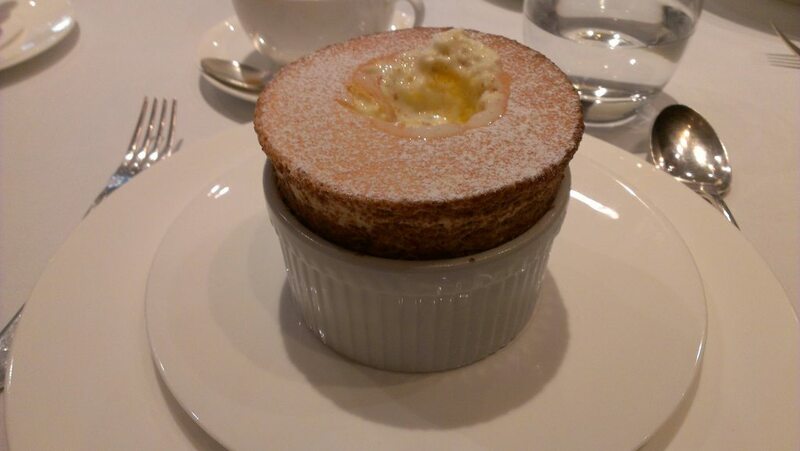 My wife had the Apricot and Vanilla Soufflé with Camomile Ice Cream. Rising to the sky, an enormous souffle was presented and the waiter then added the ice cream and poured in an apricot sauce. Fantastic in both execution and flavour, it provided a perfect finish to her lunch. 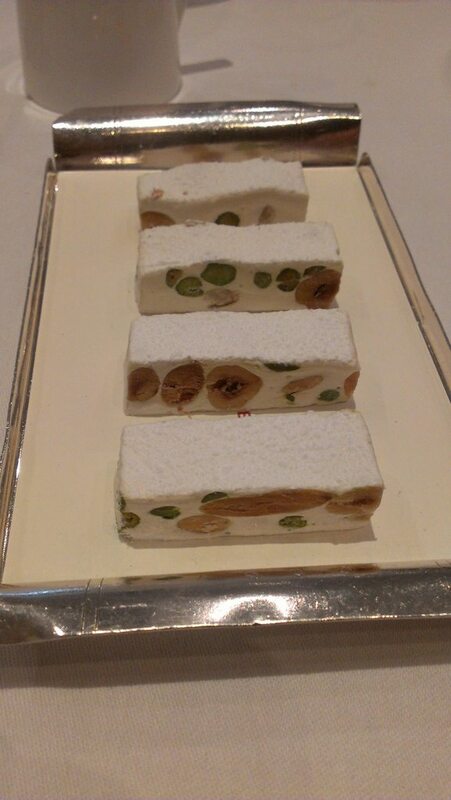 Nougat came with coffee and was a fine example of its kind, pretty as a picture too. The bill came to about 300, and included a glass of rose champagne to start, 2 glasses of wine for my wife, and a few bottles of water. I really enjoyed the meal at The Square, especially the theatrics of the starter and the spherified dessert. Surroundings and service were first rate too. 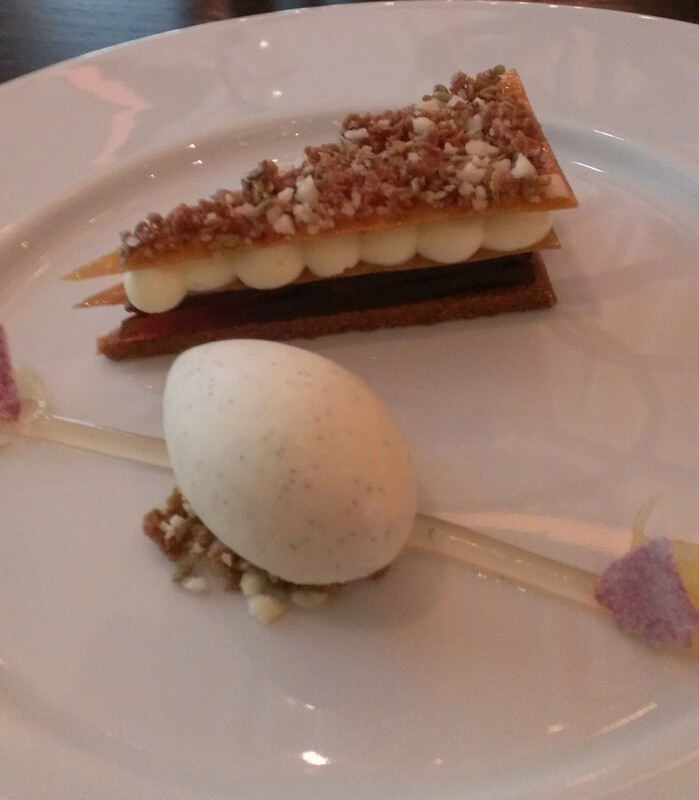 We had an incredible lunch at Dinner, Heston Blumenthals London restaurant based at the Mandarin Oriental in London. Upon arrival we were seated at a great table, right next to the glass walled kitchen and pineapple spit. The waiters explained the concept of the restaurant and assisted my wife in choosing vegetarian dishes. I had already decided what to have before I left home, due to Heston's TV programmes and the many reviews found online raving about certain dishes. White and brown bread were provided, the brown being the better of the two, with a particularly nice crust on it. 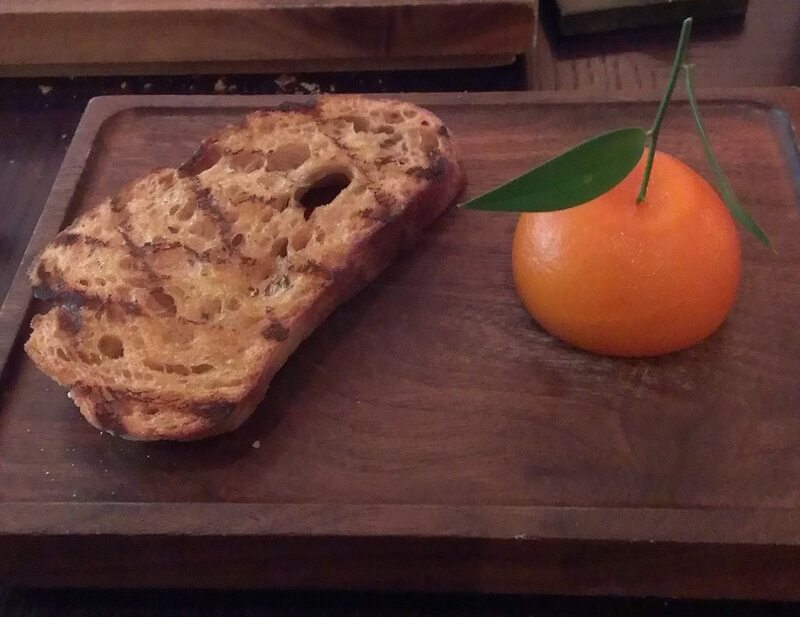 My first course was the famous Meat Fruit, a chicken liver and foie gras parfait with a mandarin jelly skin. The parfait was incredibly light, almost like it was whipped, and beautifully flavoured. The mandarin skin provided perfect balance, and was rich with scent and flavour of mandarins, and balanced perfectly with the parfait. My wife chose a variation of the nettle porridge, which usually comes with cod cheeks. 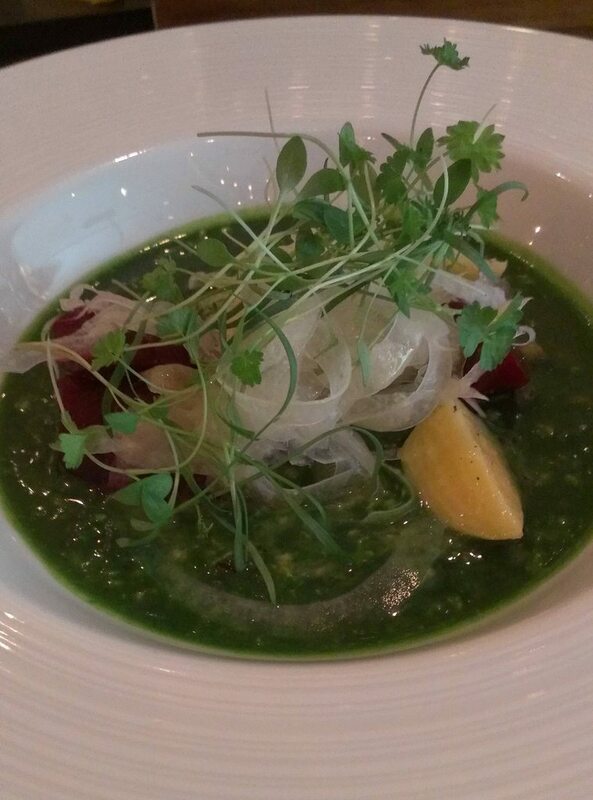 The nettle porridge itself was earthy, savoury and well flavoured, with the smoked beetroot and fennel complimenting it perfectly. 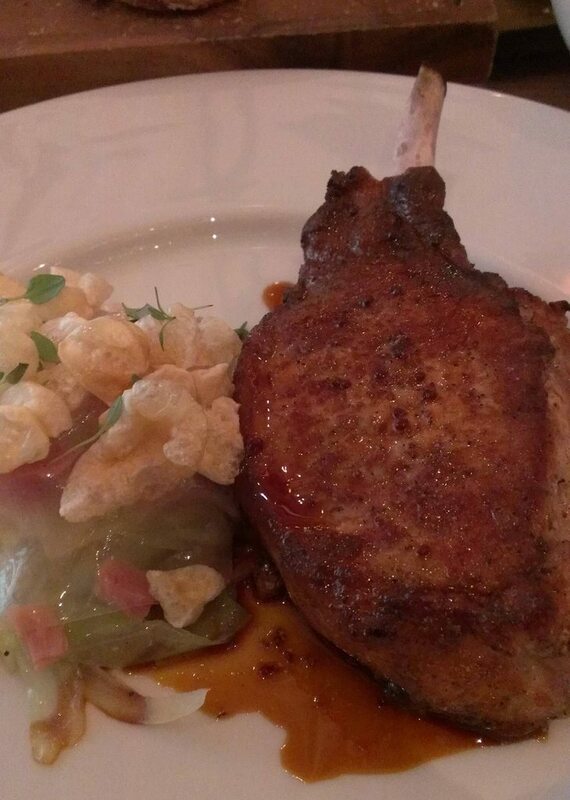 For my main I had the Black Foot pork chop and sauce Robert. The huge pork chop was a supreme example of its kind, moist, and the salty, sweet coating and sauce rich with a barbecue smokiness. It came accompanied with cabbage and ham hock, and some rather fantastic crackling puffs, more like a rice crispy than crackling, they were so light you could literally blow them across the plate. I had a side of mashed potato, one of those 50% butter affairs found in Michelin kitchens around the world and was perfectly done. 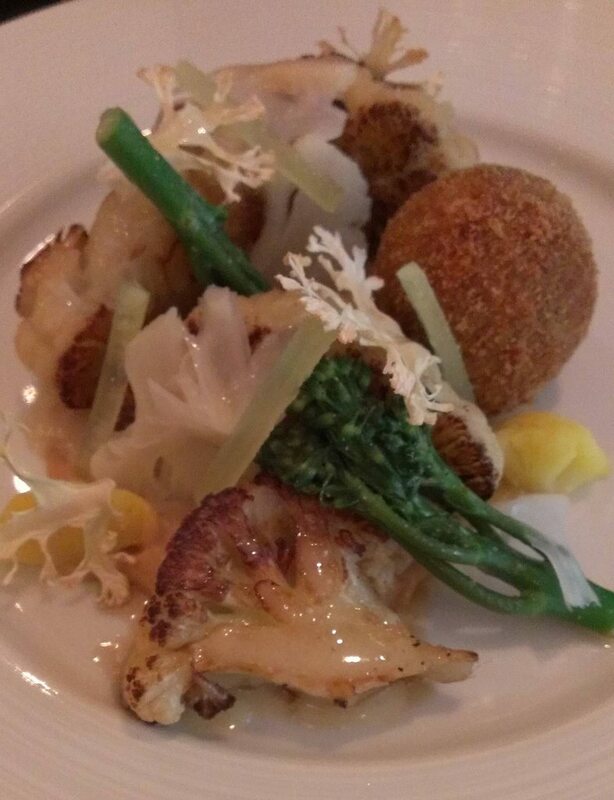 My wife's main was "a made dish of Parmesan", thick slices of caramelised cauliflower, crispy wafer thin cauliflower pieces, a scotch egg made with a quails egg, horseradish and parmesan sauces. This was a well thought out and original vegetarian dish, and my wife believed it was one of the finest mains she has had recently. For my dessert I had the Taffety Tart. Pretty as a picture, this was a apple and fennel on biscuit, with wafer thin pastry and cream layers. Topped with crystallised fennel and rose, it was accompanied with a tart citrus jelly, sugared rose petals and a vanilla ice cream. Although I think i might have liked to try the blackcurrant sorbet I've seen in other reviews instead of the ice cream, it still went well with the apple and citrus elements. The unusual flavours, exquisite technical and presentational skills all added up to a memorable dessert and met my expectations completely. 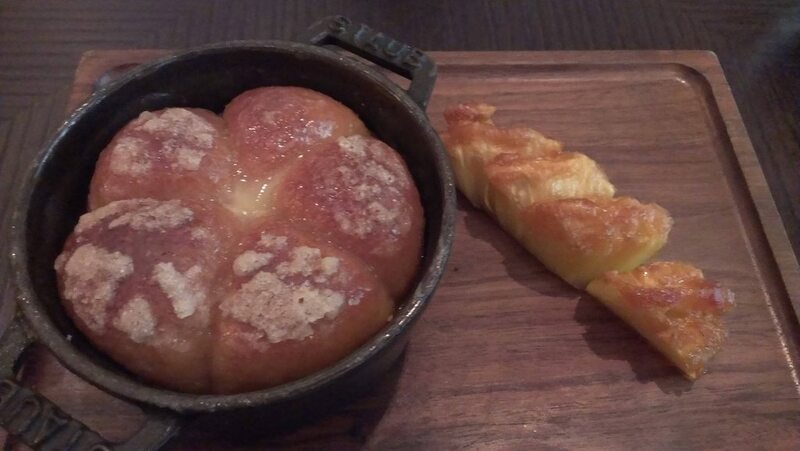 My wife's Tipsy Cake was a wine soaked brioche served with spit roast pineapple. Although it looked rather heavy, it was a light and fluffy brioche, and was wet with the wine and syrup. The pineapple was amazing, caramelised and sweet, having lost the tartness you can get with pineapple and matched the brioche very well. 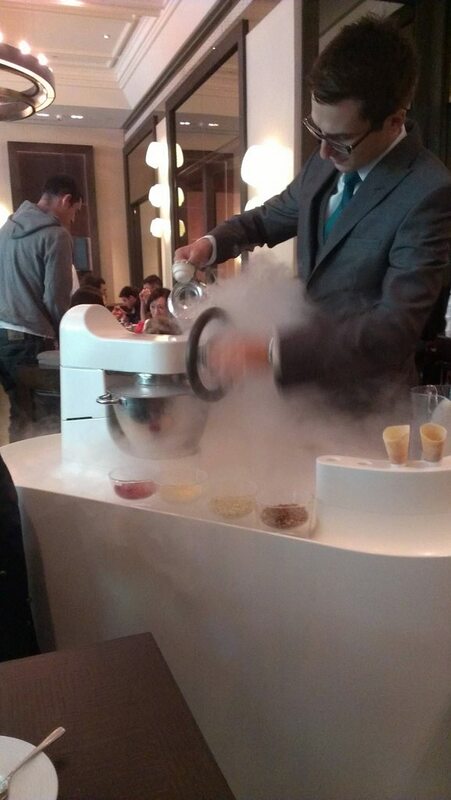 One last treat awaited us, we decided on an extra course, from the Liquid Nitrogen Ice Cream trolley. The trolley was an impressive looking set up, custom made for Dinner. A custard was added to the bowl, and the liquid nitrogen poured in and hand whisked to get the right consistency. 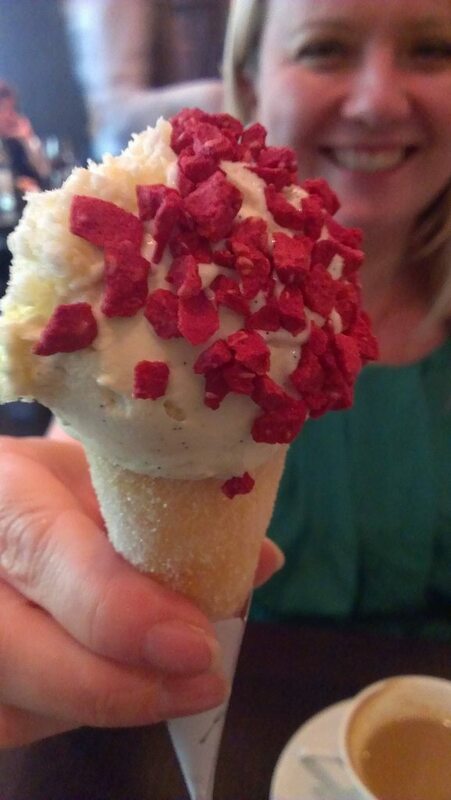 The ice cream was served a hand made cone of thin pastry, with strawberries added to the cone first. It was then rolled in a topping, and you could choose 2 from chocolate and hazelnuts, candied fennel seeds resembling hundreds and thousands, and the two we both chose, apple popping candy and freeze dried cherries. It was certainly the best ice cream cone I've had, not just for the ice cream itself but the theatre of the trolley itself. Liquid nitrogen ice cream, dried cherries, apple popping candy, my beautiful wife. We also had coffee, served with a marvellous pot of earl grey and jasmine chocolate ganache and a caraway biscuit. The ganache was particularly fine, leaving a heady, perfumed after taste that was most pleasant. I am glad with the hype around Dinner that the meal lived up to its reputation. We enjoyed every element of the meal, the service was friendly and knowledgeable, the staff describing the history and make up of the dishes with passion. The meal came to just over 200, we also had a bottle of mineral water, a glass of champagne to start and my wife had a glass of Pinot Grigio.